December was a solid month for the regional economy with continuing good news on the housing front. 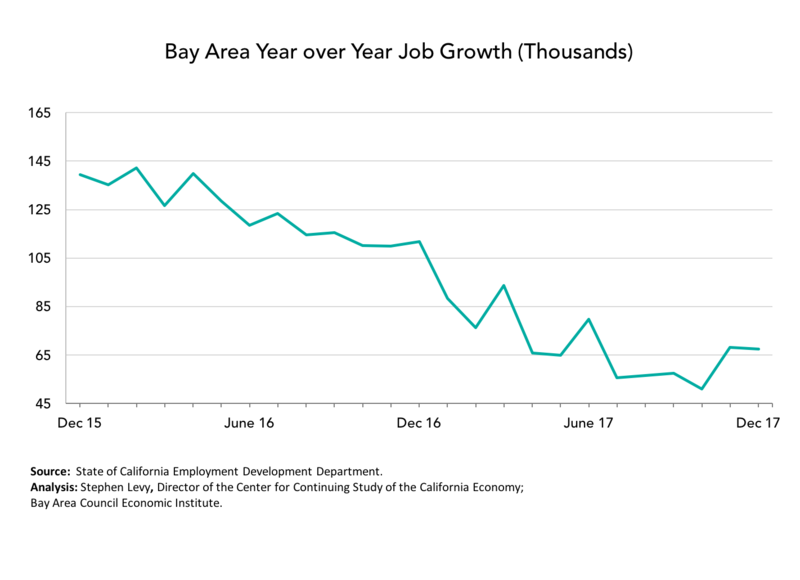 Bay Area job growth in December kept the year over year growth comparisons steady after a long series of declines. At the same time unemployment rates in December fell to the lowest levels ever while more people joined the workforce. Large tech company expansion plans continue on track with Google and Amazon making a series of new facility acquisitions. 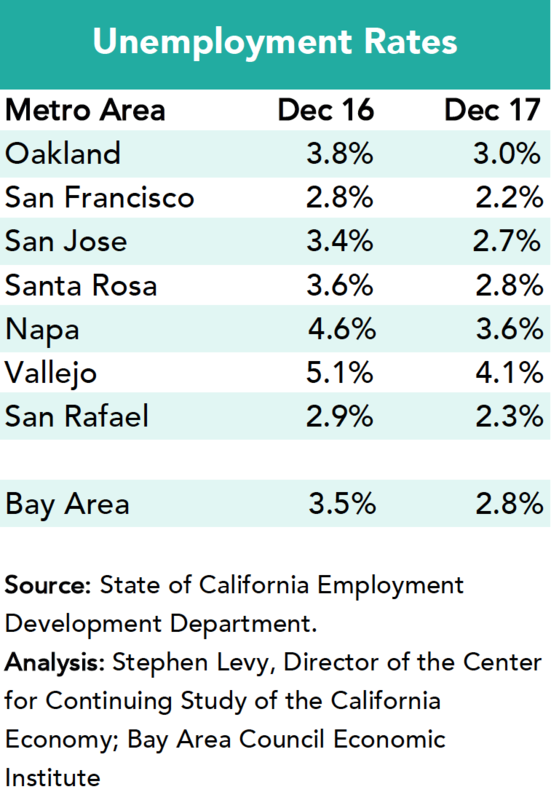 The Bay Area posted a 1.8% job growth rate during the past 12 months and the state job growth surged in the past two months to far outpace the nation. 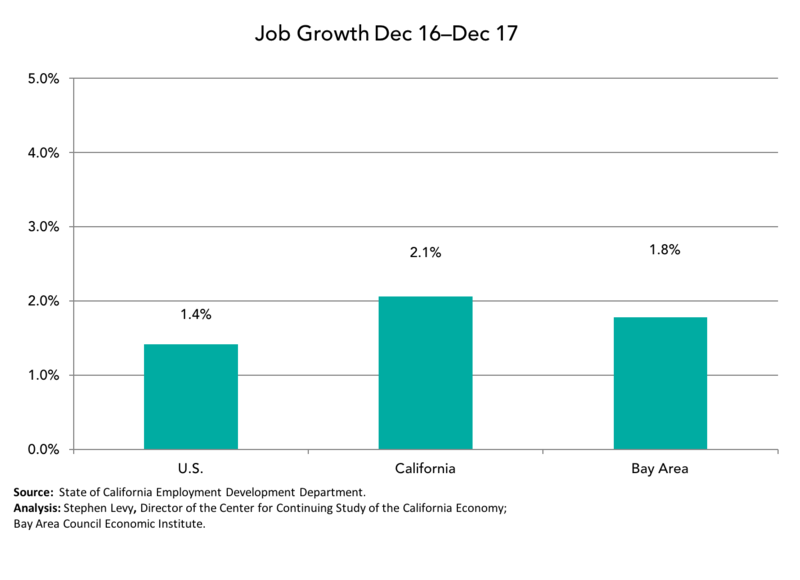 Job growth in December came mainly from the San Jose metro area. 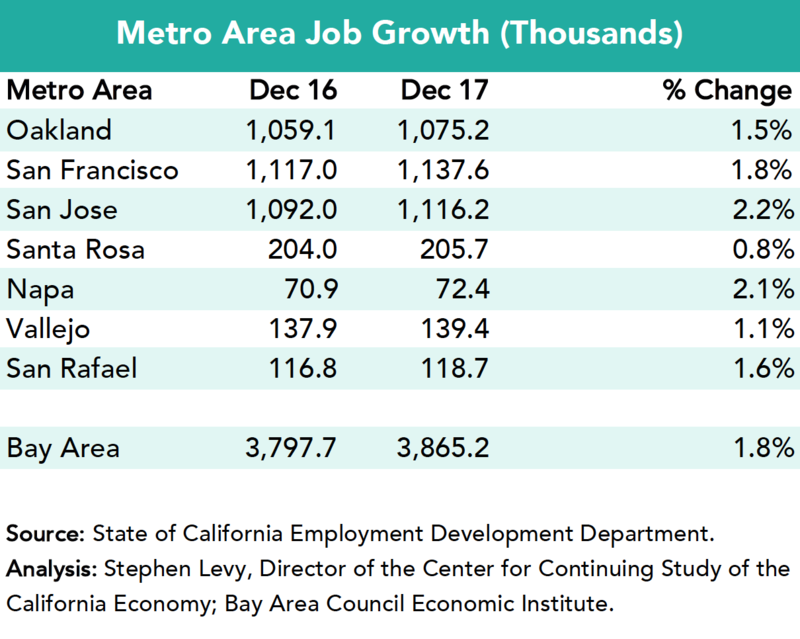 On a year over year basis five metro areas outpaced the nation in job growth with the Santa Rosa area restrained by the fires. At the same time the December data showed positive trends for labor force growth and unemployment. Unemployment rates are still falling on a year over year basis even though rates are already low. The number of unemployed residents fell from 145,600 a year ago to 116,800 last month. Labor force growth continued last month and the region has added 39,800 workers (+0.9%) over the past 12 months outpacing population growth. It now appears that the recent period of slower job growth compared to the nation is over, though the region’s housing and transportation challenges remain. There is more positive news with regard to expanding our housing supply. Housing permits are up substantially for the first 11 months of the year but more are needed. Google acquired several sites at Moffett Field and announced they hope to provide housing and retail near these job sites. Amazon is also adding sites and facilities at Moffett and recently San Jose and Santa Clara have agreed for policies that allow more housing and commercial development to move forward. 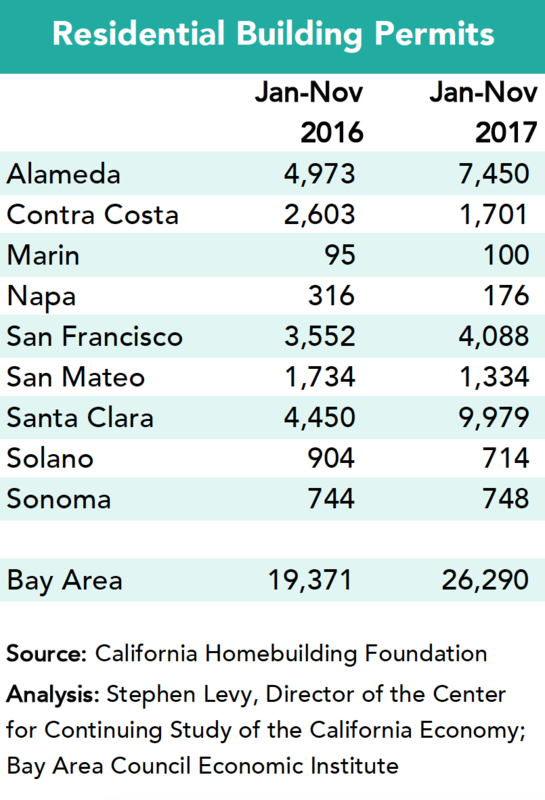 Still even the near 25,000 permits issued this year fall short of the 35,000 to 40,000 needed to keep pace with population growth while relieving some of the doubling up that has occurred over the past decade in response to low construction and rising rents. And residents have passed and will get a chance in 2018 to approve more major transportation funding measures. But the overall housing shortage is not evenly distributed among price and rent categories. Very low income households are those making between 0% and 50% of area median income (AMI). Low income ranges from 50% to 80% of AMI and moderate (middle income) ranges from 80% to 120% of AMI. 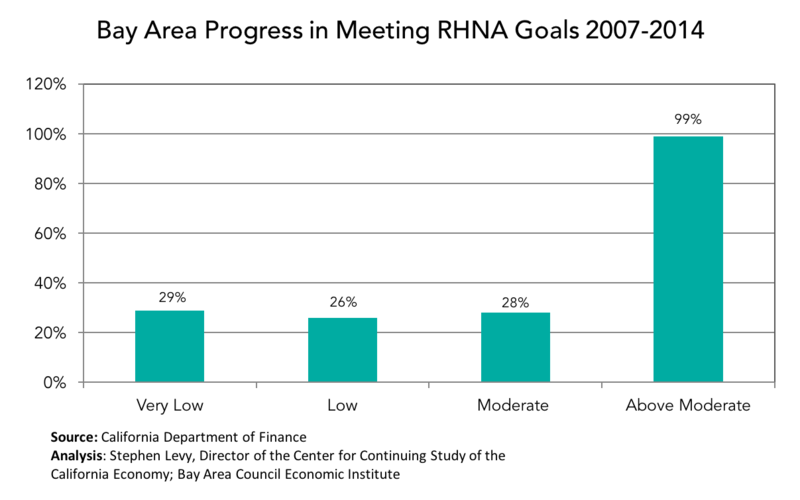 With funding and approval challenges, it is not surprising that the low and very low income targets are not being met. But the shortage for middle income households is virtually the same as that for low and very low income households. So there is a lot of work to be done at most income levels to make housing more affordable in the region.